4. Think only about 2012 with no time thinking about 2011. The only experience that is any value is experience that has been reflected upon. We all have heard that the definition of insanity is to repeat a course of action and expect a different result. Yet most of us take no time to reflect. What can I learn from what just happened? What would I do differently? What would I do the same? To make sure that 2012 is not a repeat of 2011, you need to take time to reflect. Even if 2011 was a good year, “good” will be your new ceiling if you don’t take time to reflect. 5. 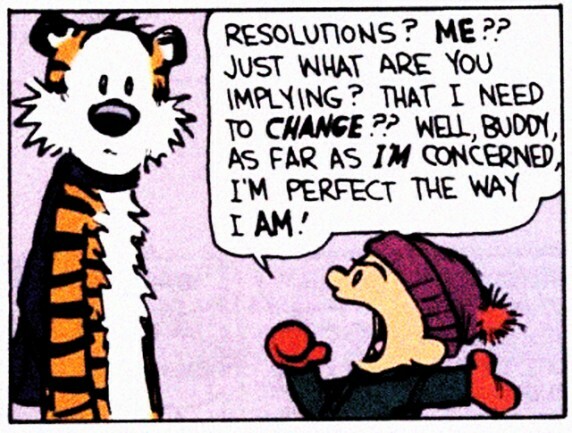 Make “resolutions” tied to a year. The life well lived is a life of integrity. What does that mean? It means that what we really value and what we do (our actions) are in alignment. Most people begin a year by making resolutions. “In 2012 I’m going to pray every day.” “This year I’m going to lose 15 pounds.” These arbitrary “goals” and the language with which they are framed set us up for failure from the start. To begin, we shouldn’t establish any goal that is out of line with our values. As I stated in the previous post, we shouldn’t base our goals on someone else’s expectations. Likewise, we shouldn’t set goals based on conventional wisdom. Just because losing weight is a “typical” resolution doesn’t mean it should be yours. Second, we shouldn’t do something for this year or because it’s the start of a new year. So what should we do? Instead of resolutions, create “I am” and “I will” statements that are grounded in who you are. Instead of saying, “In 2012 I am going to lose 15 pounds,” say, “I am a healthy, vibrant person. I will always prioritize my health.” Losing 15 pounds might become the natural byproduct of that statement of who you are, but whether it does or it doesn’t, you have begun to define yourself and live with integrity. That’s the kind of thing that will last long after the New Year’s celebrations have passed. Mediocre people focus on who they aren’t and where they’re weak. Successful people focus on who they are, and where they’re strong. If you are a 3 on a scale from 1-10 in a given area, and you work REALLY hard, you might become a 5 or a 6. But if you’re a 7 in an area, and focus your attention and effort there, you could realistically become a 9 or a 10. If you become a 9 or 10 in even a few areas of your life, you can become a superstar. Great CEO’s don’t focus on being great at every area of their operation. They focus on making their strengths stronger. Great athletes do the same. A quirky example is the former basketball player and sideshow Dennis Rodman. Rodman was a poor ball handler and shooter. He was slightly above average as a defender. However, Rodman was a great rebounder. Instead of working on his shooting and ball handling, he focused almost all his attention on rebounding and a little on his defense. As a result, he became arguably the best rebounder in the history of the game. Because of this skill, where he lead the NBA for a record 7 straight seasons, he became a highly paid and critical component of 5 NBA championship teams and was inducted into the hall of fame. Now be honest. When you think of GREAT basketball players, what skills come to mind first. Probably shooting, scoring, and moving with the ball. Rodman had less skill than many star HIGH SCHOOL players in those areas. He’s in the Hall of Fame because he worked ONLY on his strength. That’s a huge lesson for all of us. I hope these posts are valuable. I would love your feedback, questions, and comments. In case you missed it, here’s Part 1, and you can read the last installment, Part 3, here.